In every race there are so many different types of runners, and many different types of winners. Of course there are the ones we all hear about, the ones that cross the finish line first. The ones we don’t hear about as much are those that are completing a new distance, or crossing the finish line for the first time. Some have overcome insurmountable odds, and others are out running as part of their commitment to take their health and fitness serious for the first time in their life. These are just a few of the winners that will lace up their shoes on the first Sunday morning in October if you ask me, but today we are talking about yet another type of winner for the Atlanta stop of the 13.1 Marathon Series. Last week we announced the second free race entry giveaway for the quickly approaching 13.1 Atlanta. The entries rolled in throughout the week and it is now time to randomly pick the runner who will be attaching the bib courtesy of US Road Sports. Speaking of winners and the 13.1 Atlanta, the field of Elite Runners were just announced yesterday and contain the likes of Reuben Mwei, Emmanuel Ngatunyi, Jynocel Basweti, Cory Baumann, Martin Hernandez, and Daniel Kirwa for the men while Tamara Karrh, Lilian Mariita, and Risper Geswaba will be battling it out amongst the other women. You can read the complete Elite Runner Press Release for more information on the individual runners. And now on to the reason at least a few of you are reading. 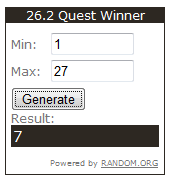 There was a total of 27 entries which I put into the handy random.org number generator shown to the left. After the quick click of the button the number 7 appeared revealing Pam Burrus from Moms RUN This Town on Facebook as the round two winner of the 13.1 Atlanta race entry. Pam, please contact me at info@262quest.com so I can send you the code so you or a friend can get registered. I need to hear from you by Sunday night or I will need to pick a new winner so we can make sure the free entry gets put to good use. If you are not the winner and still need to register, you can still register online up until the 28th and make sure you use the discount code: BROOKHAVEN131 to get $13.10 off of your race entry. While you are registering don’t forget to register for the ATL Challenge. Don’t forget to connect with 13.1 Marathon for more information about this and many other races. You can connect with 13.1 Marathon on Facebook and on Twitter at @131marathon. You can also connect with 26.2 Quest on Facebook and on Twitter at @262quest. Dang! Was hoping to get in on that one! Congrats Pam!!! Sorry, but don't give up yet! With a race this close you don't know what may happen and Pam may not be able to use the entry. If that happens I will pick another winner as soon as I find out. 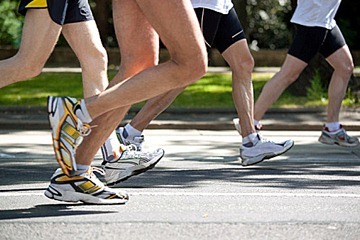 Don't forget -- runners can use offer code BROOKHAVEN131 to save $13.10 off when registering online. Thanks Jason! I have added that to the post above as well.